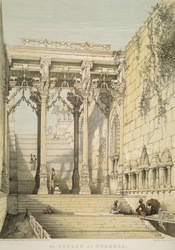 This is plate 17 from James Fergusson's 'Ancient Architecture in Hindoostan'. Bundi in Rajasthan is known for its many baolis (or step-wells), an architectural feature unique to India. The most famous is the Raniji-ki-baori, built by Rani Nathwati in 1699, with its fine arches and carved ornamentation. Entered between two pavilions, 113 steps lead down to the water some 70 feet below. At the half way point are these columns.